With all the talk of a restaurant recession, these three companies have strengths and catalysts that could make them smart investments now. Last year was tough on restaurants. According to industry tracker TDn2K in its Restaurant Industry Snapshot, same-store sales -- a metric used to evaluate sales from locations open for at least a year -- declined 2.4%, with the fourth quarter of 2016 producing the worst quarterly results since the Great Recession. Furthermore, the report noted that the industry had "posted four consecutive quarters of declining year-over-year sales." Foot traffic at restaurants was also down 4.6%, a decline not seen in over seven years. With this kind of news, investors must be wondering if there are any companies in the restaurant industry worth a look. Fear not, intrepid investor: There are still ways to profit for those willing to broaden their horizons beyond traditional restaurant stocks. Those looking to benefit from underappreciated options would do well to consider Starbucks Corporation (NASDAQ:SBUX), The Middleby Corporation (NASDAQ:MIDD), and Chipotle Mexican Grill, Inc. (NYSE:CMG). Starbucks Unicorn Frappuccino takes the world by storm! Image source: Starbucks. While the rest of the industry was dealing with the restaurant recession, Starbucks was dealing with high-class problems of its own making. When the company rolled out its Mobile Order & Pay (MOP) app, it failed to appreciate the reception it would receive from its customers. The number of stores that had more than 20% of their transaction volume from MOP orders doubled from 600 stores to over 1,200 stores over the last year. The unbelievable success of that program resulted in long lines and bottlenecks at the pickup point, causing some customers to leave without ordering. The company has stepped up efforts to roll out best practices to those locations and believes it has addressed the issue. Earlier this month, Starbucks set the internet ablaze with tales of its color-changing limited edition Unicorn Frappuccino drink. Many locations were sold out before the five-day promotion ended, and in a statement to Boston.com, Starbucks said, "We've been thrilled with our customers' enthusiastic reaction for the Unicorn Frappuccino; its fandom has exceeded everyone's expectations." This has caused some analysts to raise their expectations for the current quarter. While not strictly a restaurant stock, Starbucks is bound by the same measures. During its most recent quarter, the company saw comparable same-store sales that increased 3% year over year, while producing record revenue that grew 7% to $5.7 billion and earnings per share that grew nearly 11%. In this environment, that type of growth is as rare as a Unicorn Frappuccino. Energy-efficient ranges save restaurants money. Image source: Middleby. While Middleby may not be a traditional restaurant stock, there's a pretty good chance that the food you've eaten at a restaurant was prepared using Middleby's products. The company claims that 1 in 3 restaurants in the world is using some piece of the company's equipment. It's an industry-leading provider of commercial cooking and food preparation equipment. Middleby is home to nearly 100 top brands in the foodservice industry, including Turbochef, Toastmaster, and Middleby Marshall. These appliances cover a wide range of professional ovens, food processing equipment, drink dispensers, and deep fryers. At a time when costs for everything from ingredients to wages are going up, Middleby offers savings through energy efficiency, decreased food preparation times, and less food waste. This allows the company to offer an industry-leading guarantee: Customers can return any piece of equipment up to one year later for a full refund, with no questions asked. In its most recent financial release, Middleby reported net sales that increased by 11.6% for the quarter and 22.4% over the comparable prior-year period. Earnings per share rose 60% for the quarter and 48% for the year over the previous-year periods. Doesn't sound like a recession to me! For a while, Chipotle couldn't get a break. The company faced numerous bouts of foodborne disease including salmonella and multiple outbreaks of E. coli and norovirus in late 2015 and early 2016 that infected dozens of customers and caused the company to revamp its food preparation methods. Comparable sales fell by 20% in 2016. In the year since the end of the outbreaks, the company has worked hard to win back customer business by offering promotions and free burritos. The company has also focused its message on the lack of artificial colors, flavors, and preservatives in its food, in an attempt to re-energize its "Food with Integrity" mantra. In a survey last month from Market Force, Chipotle regained the title of favorite Mexican food chain, showing it is gaining lost ground with consumers. The company also recently raised prices in 20% of its locations, showing confidence in its position in the market. In its most recent earnings release, Chipotle reported comparable-restaurant sales were up 17.8% for the quarter, and comps will continue to be easier going forward. Revenue was also up 28.1%. For the rest of 2017, Chipotle is forecasting same-store sales in the high-single digits and plans to open 195 to 210 new restaurants. 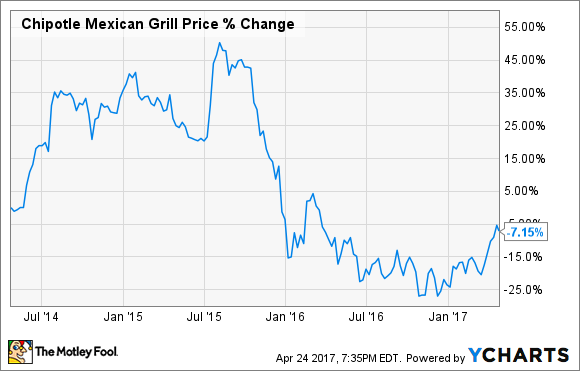 With the worst largely behind it, Chipotle represents a tasty opportunity.